People looking at buying a car that can help them cut costs may want to drop in at their local Daihatsu dealership. 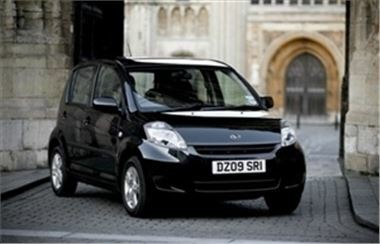 The manufacturer said the Sirion is perfect for those feeling the effects of the economic downturn. With CO2 emissions of 188 g/km, the vehicle qualifies for annual road tax of £35. Meanwhile, Daihatsu suggested the fact the model boasts fuel economy of 56.5 mpg might mean motorists can save money at the pump. In addition to this, customers may find their initial outlay is lower than they were expecting - as under the scrappage scheme the car is available from £6,320. Operations director Paul Hegarty commented: "We pride ourselves on building ultra-reliable, practical, fun-to-drive cars for the twenty-first century motorist and the Sirion is a brilliant example of this philosophy." Motorists trading in a larger model for the vehicle may also find they save money on car insurance, as smaller autos are generally regarded as posing a lower risk.